I remember a time not long ago when webinars were new and unfamiliar to most people. But now, individuals, small businesses and large organisations are all using webinars to promote their products and services, deliver educational material, and offer ongoing value to their clients and customers. There's a reason webinars are so popular, and why you should be using them in your business as well. In brief, a webinar is a presentation delivered over the Internet (The word "webinar" is short for "Web seminar"). As a presenter, you sit in your home or office with your computer, microphone and PowerPoint slides; and your audience sits in their homes or offices, with their computers and speakers. It's like being there in person, except you don't have to all gather there in the same room. In fact, that is one of the biggest benefits of webinars: you don't have to all gather in the same room. This means you don't have to spend time getting there, you don't have to waste time in traffic, and you don't have to hang around afterwards. You simply turn up at the time of the webinar, attend the webinar, and hang up. Of course, as the webinar presenter, you do have to do extra work in preparing the webinar, promoting it, and following up after it's complete. But you would do those things anyway for any presentation. Running a webinar means you save time on the unimportant things that take up time before and after your presentation. Another time saving from webinars is that they are usually shorter than the equivalent in-person presentation. A typical webinar is an hour long, but it can be as short as a 15-minute briefing or a 30-minute mini-presentation. You generally wouldn't have in-person presentations that are as short, because of the extra time involved getting people together. But there's no point stretching out a presentation to an hour or two just because you have a captive audience! You don't have to book a room, pay for catering, pay travel costs, and pay for other things that happen with an in-person event. Webinar technology does cost something, but not much. There was a time when any Internet conferences needed high-tech equipment in a custom-built studio. But that's no longer the case. If you have a reasonably modern computer and broadband Internet, that's good enough for presenting and attending webinars. The webinar technology itself is also very affordable. You typically pay a low monthly fee for using it, and you can run as many webinars as you like. Even if you only run one webinar a month, you would usually pay far less than you would for an in-person event. A webinar won't be the only part of your online platform, but it might well be the most personal interaction you have with your network - apart from one-on-one interactions. Webinars combine visuals, audio and interaction, so they are often more engaging than written material such as newsletter articles, blog posts, e-books and media releases. They also happen live (in the moment), so participants can interact with the present during the webinar itself, rather than having to send e-mail or comment on a blog post. 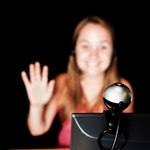 How can YOU use webinars? If you're in business, you probably want to save time, save money and engage more with the key people in your network. If you're not already using webinars for this purpose, perhaps you should!